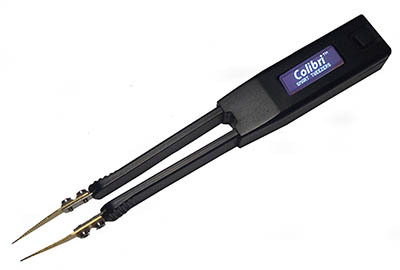 The Colibri is the model right between Smart Tweezers and the LCR-Reader. Built from the LCR-Reader, the Colibri offers a 0.5% basic accuracy, lower price, and easy-to-use design but allows users the ability to select the test frequency for more specific measurements. Just like LCR-Reader, Colibri is able to automatically determine the type of component and the best test mode and parameters for the component under test. The main difference between the Colibri and LCR-Reader is the variable test frequencies on the Colibri. When the button on the device is pressed, Colibri will change the measurement mode (AM, L, C, R, ESR) with frequencies of 10 kHz, 1 kHz, or 100Hz available for selection. To reset the device to the default fully-automatic mode, simply hold the button down until the display flashes. The Colibri is available for around $200, making it affordable for non-professionals. This model does not come with the NIST traceable Calibration Certificate. The Smart Tweezers Blog features all the latest news about Smart Tweezers LCR-meter and the LCR-Reader.